The British luxury car-maker Aston Martin is lining up a trio of banks to lead a prospective ?4bn stock market listing that could take place within months. Sky News has learnt that the manufacturer of James Bond's vehicle of choice is close to hiring Deutsche Bank, Goldman Sachs and JPMorgan as the global co-ordinators for a long-awaited initial public offering (IPO). The appointment of the three investment banks is understood to have been recommended by board members and is awaiting sign-off from Aston Martin's two Italian and Kuwaiti shareholders, according to insiders.If confirmed, the move will see Deutsche, Goldman and JPM take the most prized positions on a public listing that has had dozens of Wall Street and City banks clamouring to be involved.Aston Martin, which said in February that it was examining "a range of strategic options...including the potential for an IPO", is expected to broaden the syndicate of banks as a float draws nearer.London is the frontrunner to secure an Aston Martin IPO, although its board and shareholders are also considering New York as they seek a luxury goods valuation similar to that achieved by Ferrari, the US-listed Italian car marque.If it does list in London, it may also list Global Depositary Receipts, a form of instrument linked to a company's shares, in New York, according to insiders.The Gaydon-based car manufacturer is also preparing to recruit an independent chairman in preparation for the flotation. Aston Martin, which reported a strong set of full-year results just over five weeks ago, unveiled plans to revive its Lagonda brand as an all-electric marque at the recent Geneva Motor Show.Andy Palmer, the company's chief executive, said the revamp would "appeal to people other than traditionalists, such as those who want to upgrade from a Tesla".In an effort to embrace growing demand for electric vehicles, Aston Martin has said that each of its models will be developed with hybrid technology or full battery power by 2025.Aston Martin, which faced years of financial struggles, has delivered a turnaround in its financial performance, to the relief of its main shareholders, ‎Italy's Investindustrial and Investment Dar, a Kuwaiti vehicle. Daimler, the German car manufacturer which owns Mercedes-Benz, also holds a small stake. 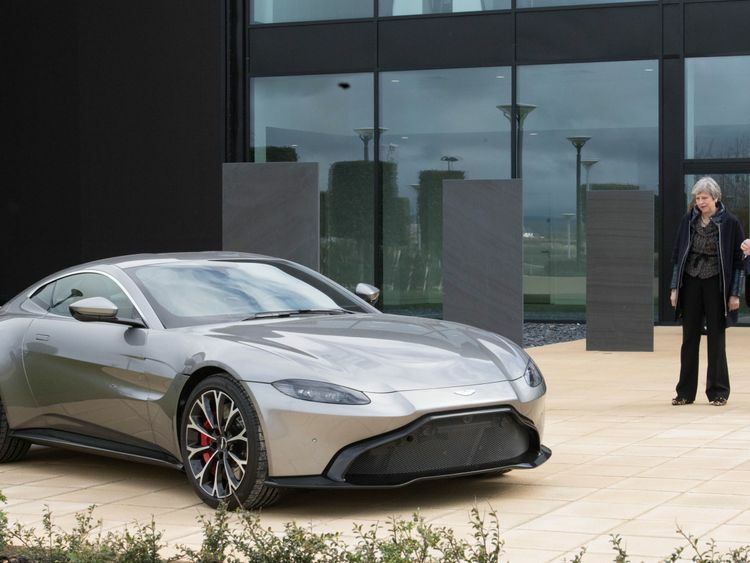 The company recently reported the highest sales in its history last year, at €876m, with pre-tax profits of €87m.Aston Martin's stock market debut will bring a dash of glamour to the public markets, regardless of whether the maker of the DB11, Vantage and Rapide models opts for a London or New York listing.Aston Martin's shareholders are being advised ‎by Lazard, the investment bank, on their strategic options.Its recent performance has enabled it to draw up plans to enter the lucrative SUV market, with the DBX expected to go on sale in 2020.Based in Gaydon, Aston Martin employs more than 2,700 people, and sells its cars in 53 countries.Aston Martin's growth prospects have been spurred by its strong performance in overseas markets including China, where it plans to open 10 new showrooms.The carmaker announced the expansion during Theresa May's recent trade visit to China, where she was joined by bosses including Aston Martin chief executive Andy Palmer.Aston Martin's chairmanship currently rotates between its two largest shareholders, but the company will shortly begin a recruitment process to identify an independent chairman, according to insiders. Analysts believe the company will list with a valuation of between €2.6bn and €4.4bn.A spokesman for Aston Martin declined to comment on the potential appointment of Deutsche, Goldman and JPMorgan.